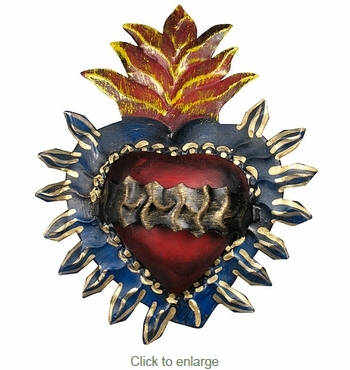 This folk art spiked crown heart wall decoration will add unique interest to any wall in your southwest hacienda home. These tin folk art items are all handcrafted in Mexico. This beautiful hand painted heart on tin can be displayed in a traditional home altar, or given as a special gift.